I decided to start with the Prequel (written in 1950) Mr Midshipman Hornblower, why? mainly because I wanted to start at the beginning of the story as opposed to the first book released… I don’t think it really mattered – I just wanted to! Set in the period of the French Revolutionary Wars this book is a series of short stories detailing Hornblower’s eventual rise to Lieutenant. While Hornblower is a character the events and history is real – the power of the English Navy is awesome as they battle against not only France but Spain in both the Atlantic and Mediterranean Sea. This was the time of Nelson, a few short years before Napoleon and to keep it in perspective the US only commissioned it’s first 3 Navy vessels in 1794, the year Hornblower joined the Royal Navy. The stories are well written with some fast paced action and lots of sailing… so much sailing and rigging and main sails and other sailing stuff I know little about… I understand why so many sailors like the Hornblower series! 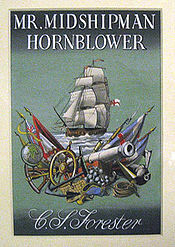 However even with this sailing and ship motif there is enough of a story line to keep a landlubber like me interested – so much so I am keen to get started on the rest of the Hornblower books. This is a great way to learn about history through the eyes of a (not so average) semi-hero – a young man growing and learning about the Royal Navy, war, ship to ship battles and the struggle of command. I am happy to recommend Mr Midshipman Hornblower and look forward to following his adventures again.